Aesthetic Medicine, including the relevant aspect of Skin Agin, is becoming, each day, more important as HEALTH is considered as “a state of complete physical, mental, and social well-being, not merely the absence of disease or infirmity. All of us, at Luzdoc, would like to to congratulate Dr. Joanna Karamon for having recently obtained a distinction in her MSc (Master of Science degree) in Skin Aging and Aesthetic Medicine from the University of Manchester. I have asked Dr. Joanna to write for us about Skin Aging. One of the first requests I hear during my Aesthetic consultations is: “…Doctor, I want to age gracefully BUT … “, followed by a variable list of specific aspects of their face they are not happy with, a list which 9 times out of 10 ends with “… but I don’t want to look unnatural, or have a trout-pout!”. 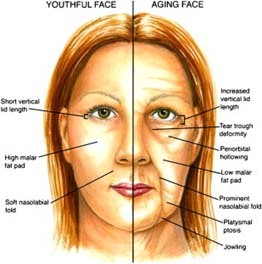 To be able to successfully treat all the different issues any “disgracefully” ageing clients want to have fixed, one has to clearly understand the physiology and anatomy of facial ageing. At the very outset of my aesthetic training, I was privileged to participate in a lecture by a brilliant Canadian Plastic Surgeon, Dr Arthur Swift, who said something that has resonated with me ever since. Dr Swift emphasised during his lecture that a wrinkle was only a SYMPTOM of a deeper underlying problem, and that if we keep only treating and “chasing” the wrinkle without addressing the reason WHY the wrinkle appeared in the first place, the aesthetic outcome of any treatment will remain sub-par. This is why the best aesthetic approach always involves a combination of various therapeutic modalities to reverse the signs and symptoms of ageing. The face can basically be divided into 4 main components: the skin, the underlying adipose tissue and fat pads, facial muscles and tendons, and the bony skeletal framework. Each element is affected by both intrinsic (our natural, genetically-driven process) and extrinsic ageing factors (such as UV exposure, smoking, diet and lifestyle as well as drug and alcohol use and abuse). A recent study by Kaur et al used an automated facial recognition system to classify and document the specific age-related anatomical changes in the face, and their impact on the new biometric technology. The authors identified the most prominent changes within the upper, middle and lower thirds of the face according to specific age groups, and found that the various changes within the facial compartments did not necessarily happen in synch with each other. -The Bony Skeleton is also affected with age, with bone resorption being most pronounced in the region of the eye orbit, the zygomatic arch (the cheek bone) and the upper and lower jaw and chin. The loss of support lends itself to further drooping and general southward migration of the overlying tissues. When putting together a total rejuvenation plan, each element has to be addressed as each one can affect the appearance of the other. So for example, a simple exaggerated nasolabial fold should not be filled without first looking at the tissue/volume loss of the cheek area as treating that area first may lift the fold sufficiently to not require as much filler product to the be used in the fold. By the same token, if the problem lies with a thin, saggy wrinkled skin, until the issue of skin density is addressed, no amount of filling will make the face look natural and not over-filled. During the ageing process, the overall facial shape changes from a youthful, rounded one to a more angular aged one, hence the aim is to restore that rounded, less hollowed-out aspect without looking ridiculously puffed out. Deciding which treatment options should be used where goes about one simple principle: is the issue due to a loss of underlying volume, or is it due to a dynamic, over-working muscle? This will guide us in deciding whether wrinkle relaxing injections using botulinum toxin are indicated for that specific area or whether simple filling with dermal filler materials is more appropriate, or ultimately whether a more ablative method is necessary such a laser-driven or plasma surgical tissue sublimation to literally get rid of excess tissue. Understanding this process allows us to also do age-appropriate interventions, and should prevent those unnatural looking changes seen on many celebrities. Doing aggressive interventions prematurely can have the consequences of the natural ageing process happening in a very out-of-synch pattern, making the whole process very disturbing aesthetically. Obviously, some individuals with inherent anatomical defects may need a more definitive and aggressive interventions at even a very young age to simply make them look and feel “normal”. Beauty remains in the eye of the beholder, but the Aesthetic Practitioner has the added responsibility of making the client see that their perception of beauty may well be very skewed. A client is not always right in some instances … and just because they are paying for it, they should not be made into grotesque caricatures of what human beauty looks like. We are not Ken’s and Barbie’s, we are unique individuals and should always remain so. NOTE: I would like to thank Dr. Joanna for her cooperation in writing this very interesting article.